For a luminous wash of colour and seamless, subtle sculpting, this luxe, crème-to-satin palette unites neutral bronzer, sheer rose blusher and champagne-hued highlighter in a signature Hourglass compact. Effortlessly easy to blend, each weightless shade imparts a soft, natural finish that remains fresh as the day (or night) wears on. Like the entire Hourglass range, this sleek, sophisticated trio adds a welcome touch of luxe to any make up collection. 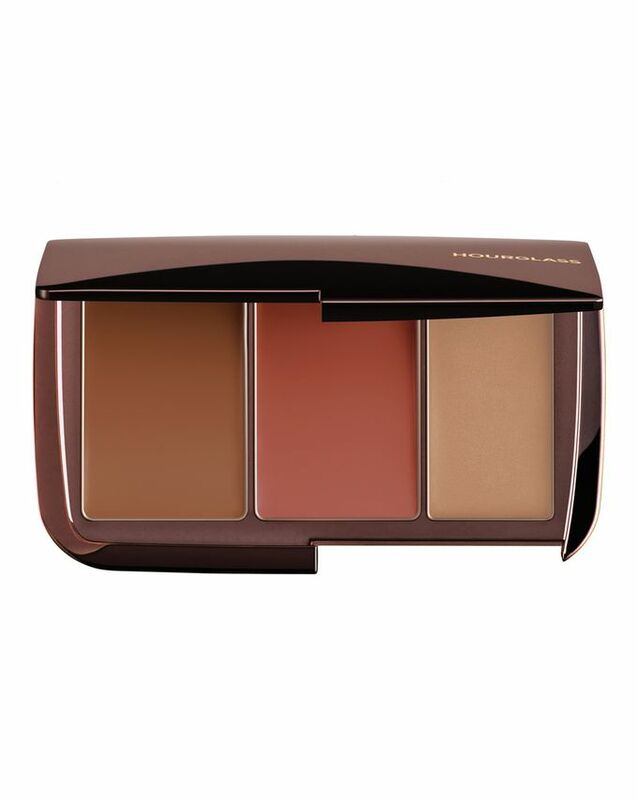 Instantly awaken your face and achieve seamless, oh-so subtle sculpting with Hourglass’ Illume Sheer Color Trio - Sunset. With a trio of crème-to-satin formulas, this palette imparts a luminous wash of colour to skin, providing everything you need for a sheer touch of colour and definition. The weightless crèmes are highly blendable and mistake-proof, resulting in an effortless, natural look. The neutral bronze tone creates a natural tan, subtly defining your facial contours, while the sheer rose blusher gives soft, universally flattering colour to cheeks and, last but certainly not least, the champagne-hued highlighter creates a lovely, luminous glow without heavy glitter or shimmer. The new and improved formulas allow for totally even application, melting into skin to enhance fresh, dewy radiance without blotching or streaking. Bronzer - Gently blend bronzer onto hollows of the temples, cheeks and jawline in a "3" shape. Blush - Apply blush to apples of cheeks, blending up towards the temples. Highlighter - Use the highlighter to illuminate tops of cheekbones, brow bone, bridge of nose and cupid's bow. I don&#8217;t know how to live without this product. This product is effortless and oh so effective at giving my medium skin a healthy glow. The bronzing shade is effective as a contour and bronze hybrid and the highlight is subtle yet gives off the effect of beautiful skin. I don’t use blush but the blush is wonderful for anyone going after a natural, peachy glow. I spend $$$ on bronzers and highlighters yet every year I go back to this product. I only wish it would stop selling out so fast!!!! I really love this product. The formula is incredible and works well on me all year around. I wish Hourglass would sell the bronzer as an individual product because nothing compares to this one. I highly recommend this. This is such an amazing product. I tried it with fingers and a sponge and both ways you get an easy application. Pop it quickly on the cheeks, swipe a bit on the lids, add mascara - you’re done! It also stays on the face quite good in the current heat. Was totally worth the price tag. My skin is uneven due acne etc. A lot of cream products look bad if your skin is uneven, but this product is just amazing. It doesn't look bad and it melts perfectly into your skin. The contour colour looks natural but you still look contoured. The Highlighter is beautiful and don't start with the blush. I think the colour will fit every type and I love it so much. Lately I'm really into cream products and don't think it won't be long-lasting because it will last long and even if you fresh up your make up it still looks good. This product is absolutely beautiful. It’s sheer, light and just melts into the skin. It made my makeup feel really ‘done’ and I had lots of comments about it. I’m quite fair and my sister has olive skin and it looks great on both of us. I want the whole hourglass range now. This little palette is só beautiful! It blends seamlessly and the best part of it is: it stays on all day. After 9 hours of work, it looks the same as it did in the morning. The highlighter is a little light. It is definitely not a 'blinding' one, which is actually the reason why I love it so much. It gives more of a natural glow to your cheeks. So gorgeous! This is unbelievable! Not only did it still look gorgeous after 13 hours of wear without a primer, setting powder or spray, it did this while I was at an open air concert jumping and sweating in 35 degrees, sunny weather! Yes, the blush was slightly faded but the bronzer and highlight still looked the same as they did right after application. It is beautifully pigmented, blend-able doesn't emphasize pores or texture at all and obviously long lasting. Highly, highly recommend!! I have tried many many cream and liquid bronzers/blushes/contours/highlighters and this is one that stands out! Haven't used the highlighter too much so far, but it is beautiful very natural though (don't expect a blinding highlight), the blush looks absolutely gorgeous and every colour blends out like a dream. However the bronzer is the one that is the winner for me, super to blend and sheer out and it looks great on my fair skin and on more tanned skin. It is the perfect bronzer for me and looks sooo much more natural than powder ones. if you're thinking about buying this trio, do yourself a favour and just do it! This product is amazing. I have no words!! I personally find it performs better with my fingers rather than a beauty blender. I use it on foundation although mostly on bare skin because in the summer I do not use foundation. It melts into your skin and is not the least bit greasy. It’s not dry or patchy either. It’s just perfect— the bronzer isn’t grey nor orange. It’s not very dark though, the blush looks corally but is in fact really natural and pretty and also buildable, and the highlight is a smooth non-glittery cream. Amazing amazing amazing.